A majority of states have passed laws relaxing drug policy enforcement to cut costs and reduce prison populations. 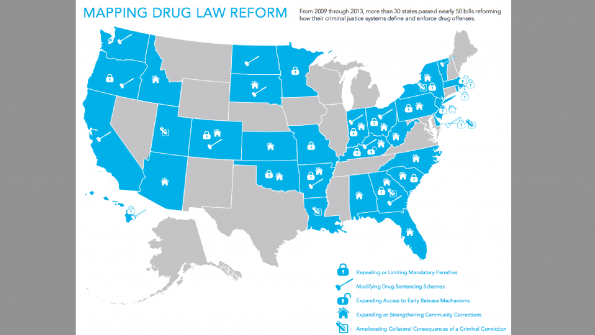 From 2009 to 2013, 31 states have passed nearly 50 laws changing the way their criminal justice systems define and enforce drug offenses. Since the “War on Drugs” began 40 years ago under the Nixon administration, billions of dollars have been spent annually to arrest, prosecute and incarcerate nonviolent offenders – mostly young, minority males, according to a study released by the Vera Institute of Justice. However, based on financial constraints, and a growing body of research that community-based treatment and support is preferable to long terms of incarceration for rehabilitating drug offenders, many local and state authorities have begun to rethink drug policy, according to the study. Mandatory penalties: States including New York have repealed or shortened mandatory minimum sentences and enhanced judicial discretion to sentence below the mandatory minimum. Drug sentencing schemes: States including Colorado have adjusted the number of felony or misdemeanor categories related to drugs or the amount of drugs associated with each level. For example, some states have legalized, decriminalized or lowered the penalties for the possession of small amounts of marijuana. Early release mechanisms: States including Kentucky have created ways for offenders to reduce sentences for good behavior, or participation in drug treatment programs. Community-based sanctions: States including Indiana have expanded community-based drug sentencing options, increasing incentives for and investment in probation or drug treatment programs. Collateral consequences: States including Utah have expanded options for sealing or expunging criminal records. Federal drug policy is conceptually shifting, but states are leading the way, due to wide public support for altering drug policy. The Pew Research Center reports 67 percent of Americans feel the government should focus more on treatment, rather than prosecution, for drug offenders. 63 percent say that states’ movements away from mandatory prison sentences are a good thing. Apart from public opinion, states have realized rising prison populations are major economic drains. From 1983 to 1997, Texas spent $2.3 billion to add 108,000 prison beds, according to Pew. Nationally, the per-inmate annual costs range from $14,603 in Kentucky to $60,076 in New York. State prisons house more than 1.35 million prisoners across the country. Drug policy changes along with falling crime rates have helped lower imprisonment rates in 31 states. From 2007 to 2012, the overall state imprisonment rate fell from 447 sentenced prisoners per 100,000 residents to 413 per 100,000, according to Pew. To learn more about this shift, read the full report, and to see what Little Rock, Ark., is doing to help reform ex-cons, check out the story. Its is really sad to hear that, billions of dollars have been spent annually to arrest, prosecute and incarcerate nonviolent offenders – mostly young, minority males. But its good that Drug policy have changed.